WARSAW – Luke Adamiec probably won’t have sugar plums dancing in his head as Christmas approaches. But his block of Elijah Hales in the final seconds of Warsaw’s 50-47 upset of Class 2-A No. 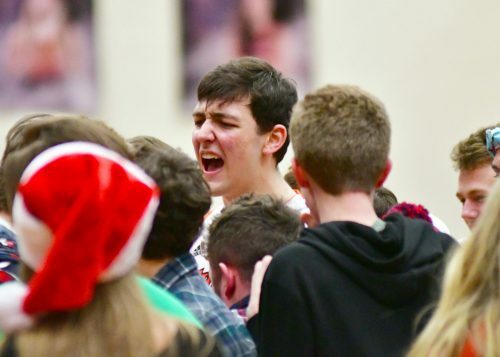 1 Westview Saturday night left him and his teammates dancing in the Tiger Den. Adamiec stepped up and blocked Hales’ jumper with just three seconds on the clock and then came down and hit a free throw with less than a second to go to play the direct hero of a wild game. Not only did Westview get one final shot that Charlie Yoder left short at the buzzer, but Hales was shooting for the win before missing with just under eight seconds left. His rebound of his miss on the three was the block for Adamiec. Even the final second was full of drama, as the referees had originally left the court after Adamiec had missed his second free throw and the ball bounced to the floor. Westview, however, was granted a timeout, and four-tenths was put on the clock allowing for Yoder’s desperation shot that rimmed out. Tyler Metzinger celebrates with his peers following Warsaw’s upset of No. 1 Westview. “I thought Adamiec did a good job,” said Warsaw head coach Doug Ogle. Adamiec scored nine points off the bench. “He came off the bench. He’s a sophomore and that’s his best game. The game itself featured 17 lead changes and Warsaw held the largest lead on two occasions in the fourth at a paltry four points. A huge Tyler Metzinger block of Nick Rensberger started a fast break to Trevor Rumple, who finished on the other end to give Warsaw a short-lived 49-45 lead. Yoder immediately came back and hit a bucket to cut the lead back to two, and Westview even got a gift after Warsaw was whistled for a five-second call under Westview’s basket. Yoder, who drew a lion’s share of attention from Warsaw’s defense, finished with 16 points, eight of those coming in the fourth. Hales had 12 points and seven rebounds and Rensberger had 11 points and four boards, but struggled to get many good looks on Warsaw’s defensive punch inside. 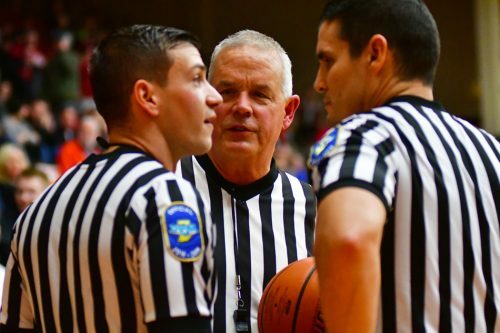 The referees discuss both time and situation late in the fourth quarter. Nolan Groninger was the scoring hero for Warsaw with 20 points to go with three steals, two rebounds and two blocks. Groninger made a nice Euro-step move to the bucket for a layup to give Warsaw 43-41 lead and also hit a pair of short-range jumpers to stall Westview wishes in the second half. Metzinger had just one basket, but had five blocks and four rebounds. Rumple was 4-4 from the free throw line after scoring a career-high 18 points Wednesday night at Whitko. “He had several big blocks tonight and was a defensive presence in the basket area for sure. He led us in rebounding, too,” Ogle said of Metzinger’s performance. Westview suffers its first loss of the season after earning its seventh win Friday night in a 28-point blowout of Lakeland. Warsaw (6-3) wins its first game this season when trailing entering the fourth quarter, as it was down 34-33 Saturday night and was 0-3 coming into the night in that facet. The Warriors will face another major Class 4-A player with it takes on Center Grove Saturday at the Hall of Fame Classic at New Castle. Warsaw will meet the versatile Ali Ali and East Noble next Saturday at Grace College. 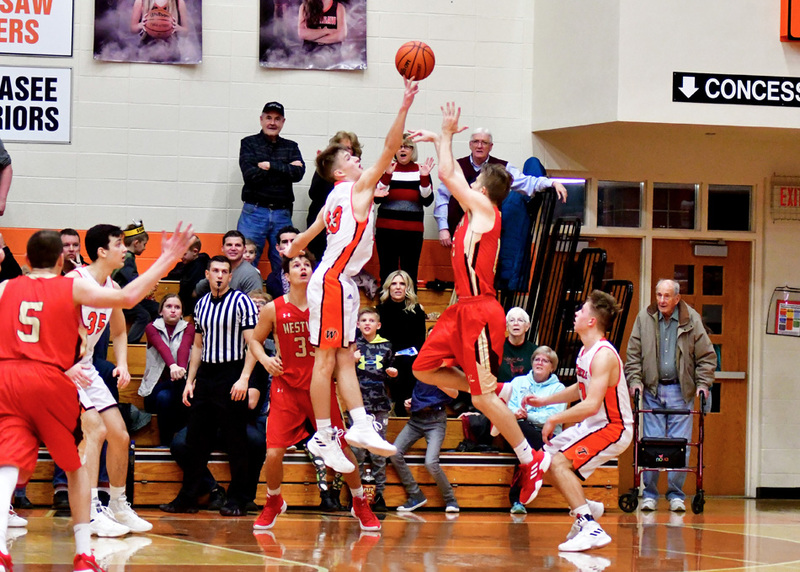 The JV game also had a storybook ending, with Warsaw coming back from a seven-point fourth quarter deficit to upend Westview 47-46. Warsaw trailed 44-37, but went on an 8-0 run to take the lead at 45-44. 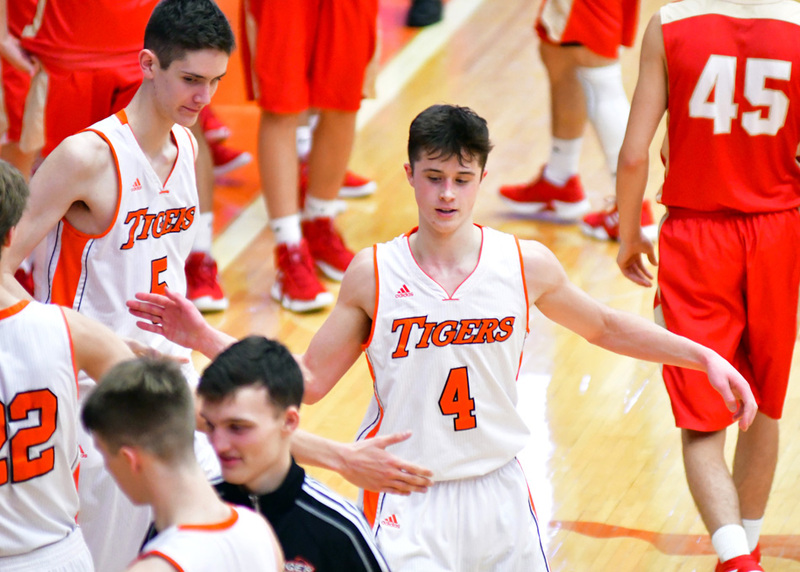 After a Ben Burkett steal and layup to give Westview the lead back, Ben Berger hit a layup for Warsaw and Brock Poe’s steal sealed the win for the Tiger juniors. Poe and Bishop Walters each had eight points for the Tigers while Burkett was electric with 23 points for the Warriors. Warsaw’s Brock Poe celebrates with teammates after a one-point win in the JV game against Westview.